FANBOY PLANET.com . 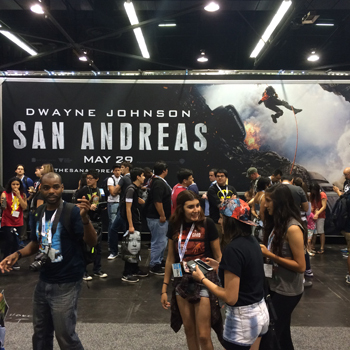 : 2015-WonderCon-San-Andreas :. Last week, Warner Brothers added a panel to the line-up at Wondercon, and the rumor sprung up that this would be where fans would get a huge taste of Superman v Batman: Dawn of Justice. I suppose it could happen, but I'd say that the physical space allotted for Warner Brothers reveals what they really plan on pushing: the upcoming action disaster drama San Andreas. No, I don't mean the movie will be a disaster. Likely quite the opposite, starring as it does Dwayne Johnson in a desperate race against California falling into the sea. If Warner Brothers could actually install their 4D experience in theaters all across the country, it ought to pack them in. But like the 4D experience offered in this portable screening room, it's likely that San Andreas takes what Earthquake had to offer and turns it up to 11. 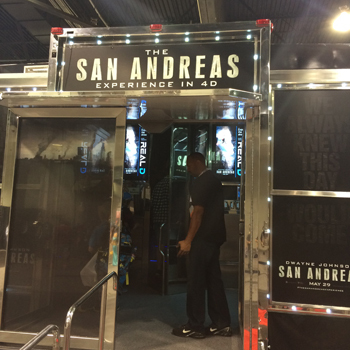 I had thought perhaps that this trailer would give everyone a virtual reality experience, as that had been a growing rage at Comic-Con. But VR also puts severe limitations on who can experience the attraction, whereas putting everyone in a 100 seat screening room allows for much greater attendance. The "shaking speaker" effect is much improved and miniaturized. Every tremor really shakes the seats without becoming deafening. In the old days of Sensurround as theaters were starting to subdivide, the experience would leak over into other houses. The San Andreas experience is very focused. Ultimately, though, it all rests on content, and this 4D is wrapped around what looks like the basic trailer for San Andreas. For free and for fun, it's worth sitting and watching. Like most disaster films, it's going to succeed or fail based on its special effects laden set pieces -- and the trailer shows off some doozies. And of course it also has the charm of Dwayne Johnson. Is that enough? I guess we'll find out Memorial Day weekend, but at least the 4D Experience got me interested in checking it out.